This uniqe tour offers you many sights and experiences to behold: An overwhelming view far into two countries (and maybe also deeper insight) from 6233 ft on the 17 m2 plateau of the powerful table mountain Untersberg, shrouded in legend; King’s Lake with its peninsula accessible only by boat and attraction for artist for hundreds of years, an enchanting walk through the “Magical Forest” along lake Hintersee and much more. These celebrities either lived there (or still sleep, or enjoyed their holidays – as you can do now – in this land of beauty and wonders. First we head for Untersberg south to the city of Salzburg. Deeply rooted rituals are still part of the life of people living in the villages around the impressive table mountain. Spiritual minds call Untersberg even the Heart Chakra of the world and a place of power. Undoubtedly Untersberg airs power and majesty and, indeed, it is worth to engross oneself in this fascinating mountain which started its uplift 70 million years ago in batches and still continues. There are about 400 caves in the mountain. Giant springs and wells (Principality’s Springs)supply water of excellent quality for Salzburg. The Untersberg Marble has been querried for about 2000 years and has been used for many famous examples of architecture. Untersberg is also an important place of discovery for fossils (f.e. the Ammonite with 2,5 m in diameter exposed in Haus der Natur-museum in Salzburg). By cable-car you will be taken up to the 17 km2 large plateau. 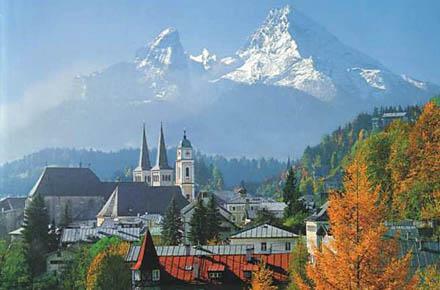 From there you can enjoy a breathtaking view far into Austria and Germany. It is even possible to watch griffon vultures, which have chosen Untersberg as their breeding area, circling in the air. Untersberg belongs partly to the Berchtesgaden Nationalpark, the only German national park in the Alps. 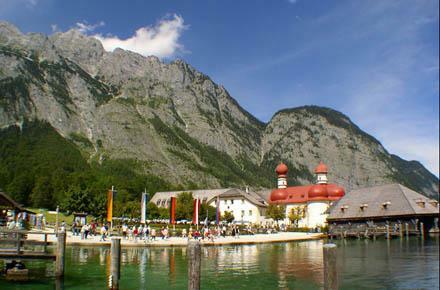 It’s centre – lake Königssee - is our next destination. Our drive to there takes us along the river Königsseeaache through picturesque valleys and the little town Berchtesgaden with its royal castle, the abbey and many other sights. The emerald-green, fjord-like lake is towered by steep walls of rock of the mountain Watzmann up to 1800m and has a depth of up to 190m. 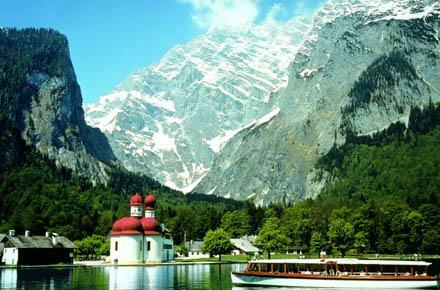 On a peninsula is the landmark of King’s Lake, the ancient Augustine chapel St. Bartholomew. For its uniqueness and beauty St. Bartholomew is world famous and very popular with artists. There is no other way to there but by boat because of the unique landscape and it is the reason for another special feature: A fascinating echo. After Kings’s Lake we head for lake Hintersee and the Magical Forest. The road to there as well as the village Ramsau is already romantic but Hintersee and the Magical Forest will enchant you. About 3500 years ago 15 million m3 of rock fell down from the mountains and blocked the valley. This was the beginning of lake Hintersee and the Magical Forest. This lake and the forest is something one has to experience outdoor. So we design the tour in a way that you can stroll through this wonderful gift of nature along the lake. It will take app. 30 to 40 minutes. You will feel like in a fairytale and it will be pure recreation in the open air. We will then take the panoramic road Alpenstraße along lake Saalachsee to the Bavarian State SPA Bad Reichenhall, the first German town to fulfil the criteria required of an Alpine Wellness location with its philosophy quality instead of quantity. Via the nice villages Bayerisch Gmain and Großgmain we will go back to Salzburg.